Third Navratra is for Ma Chandraghanta. 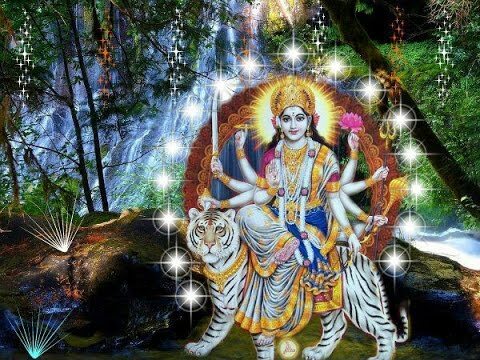 Ma chandraghanta is a third form of Ma Durga. Meaning of Chandraghanta is who has half moon shaped like a bell, she establish justice in people. She always ready for war against demons and wrong things. Ma Chandraghanta also known as Chanddi, Chandika and Rannchandi. When lord Shiva says to Ma Parvati that they would not marry with any women, she got upset and cries a lot, but Ma Parvati made him ready for marriage. When Lord Shiva comes for marriage, they bring ghosts, ghouls, ascetics, aghoris, goblins, animals and Shivagana to the gate of king Himalaya, Devi Maina ( mother of Ma Parvati) faints after watching them. So Ma Parvati transforms herself in to Ma Chandraghanta to save her parents. Ma Chandraghanta asked to Lord Shiva to appear in charming form so Lord Shiva re appear in to a form of charming prince. Then Lord Shiva and Parvati get married. Ma Chandraghanta has Rudra Roop and has eight hands holding Sword, Trishula, Gada, lotus flower, Ghanta (bell), Kamndala and one hand remains in blessing posture. She has half moon on her forehead. She rides on a tiger. People, who worship Ma Chandraghanta, get blessed with calm life. Ma Chandraghanta destroys their all problem from their life and gives them healthy life. Devotees achieve success easily if they don’t harm to anyone and follows right way in their life. She always punish to bad persons. According to Hindu mythology, Ma Chandraghanta like milk so dishes Made by Milk like Kheer is known to be prashad for Ma Chandraghanta form of Ma durga. Prasaadam tanute mahyam chandraghanteti vishruta.